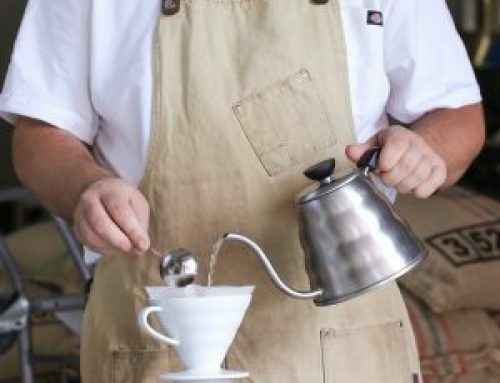 Chemex - Brewing Tutorial - Utopian Coffee Co. 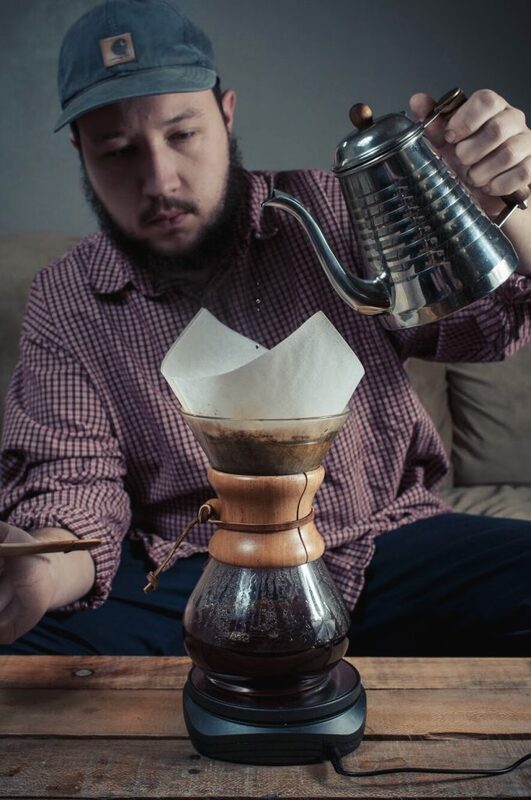 The Chemex creates wonderfully clean flavors utilizing the pourover method. Weighing your coffee is extremely important! Beans will weigh different depending on size, shape, and roast level. Weighing the beans ensures a consistent brewing experience each time! We recommend grinding 45 grams coffee on a coarse setting. The grinds should resemble sea salt. Unfold the filter and place the side with the triple-fold facing the Chemex’s “spout.” Once inserted, rinse the filter thoroughly with hot water. 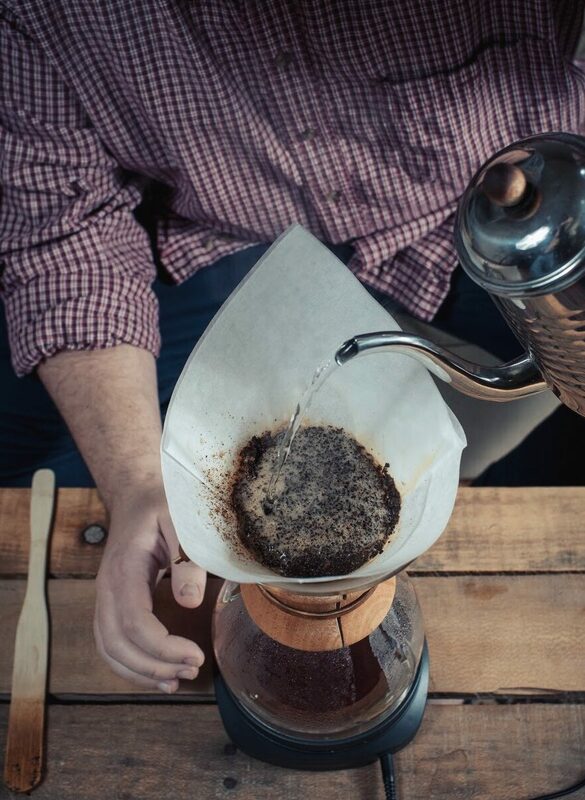 The Chemex uses a thick filter which in turn ensure an exceptional drinking experience. Rinsing the filter removes any of the “papery” tastes and warms the vessel to retain heat during and after brewing. After rinsing pour this water out. At this point we’re about ready to begin brewing. 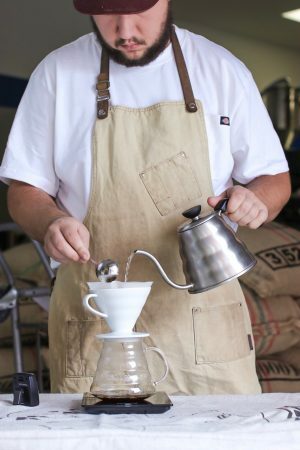 Pour your coffee grounds into the filter and “shake” the Chemex to create a flat bed of grounds. Once this is complete, use your heated water to begin pouring. We recommend pouring about 150 grams of water over the grounds in a slow, circular motion (ensuring all the coffee is thoroughly saturated). Once done pouring stir vigorously vigorously and allow to sit for 30-40 seconds before continuing to pour. At about 30-40 seconds after the first pour, add 200 grams of water in the same circular motion (slowly and deliberately) . Continue to add 200 grams of water every 30-40 seconds until reaching 750 grams. Total brew time should be about 4-6 minutes depending on roast style and bean origin. Once the coffee is finished dripping remove and dispose of the filter. Swirl the coffee in the Chemex and serve into a warm mug!